Bayou Gold address, phone, website, and more. Bayou Gold is the leading refiner of precious metals in Louisiana. Visit one of our stores for a personal, private and profitable experience in selling your old, unwanted, outdated or just plain ugly jewelry. 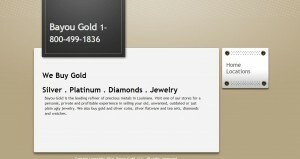 We also buy gold and silver coins, silver flatware and tea sets, diamonds and watches.